What are contact lens ? The technology for correction of visual impairment has grown since the invention of corrective lenses 120 years ago. Corrective lens or better known as "spectacles" works by aligning a lens in front of the patient eye. This lens are held in place with a frame worn around the patient face. The lens will than refocus the light to improve the patient vision. Contact lens are newer technology that place the lens directly on the patient cornea. As you can imagine, this is far less clunky than a spectacles and offer better peripheral vision. The lens on contact lens are also not affected by condensation or rain. Because of this, they are ideal for outdoor activities and sports. Although contact lens are considered as medical devices and are use to treat myopia ( shortsightet/ nearsighted ),hyperopia ( farsightedness/ longsighedness ),astigmatism and presbyopia they are sometimes worn for cosmetic reason. What are contact lens for ? Contact lenses are commonly used to correct refractive error. This is done by re-focusing the light so that the light enters the eyes with the proper power for a clear vision. These corrective measures are commonly used to correct myopia and hyperopia. To correct astigmatism, toric contact lenses are used. Toric lens is a lens with different optical power and focal length in two orientations perpendicular to each other. In the case of presbyopia ( In which the wearer need of two different prescription. One for distance and another for reading), two method are available. You can chose to wear multifocal contact lenses or to wear a different set of corrective prescription for each of your eyes. Multifocal contact lenses are usually designed for constant distance viewing in the centre of the lens. Aside of correcting the refractive error of your eyes, contact lenses are also use to change the appearance of your eyes. These types of lens are called cosmetic contact lenses. Although not always the case, cosmetic contact lens may also correct refractive error. Cosmetic contact lens can be use to change the visual appearance of your eyes. They can change the colour of your eyes or the size of your eyes. What are the type of lenses? Commonly known as Hard Lenses, this type of lenses are made from Perspex or Plexiglas and tend to be rather uncomfortable to wear. Although they tend to last longer than soft lenses, most hard lenses do not allow oxygen to pass through to the cornea. As such wearing hard lenses for extended period of time are not advisable. Soft lenses tend to be the preferred lenses by most contact lens users. Unlike hard lenses which are made from Plexiglas, soft lenses are usually made from hydrogel or silicone hydrogels. Compare to hard lenses, these material have high oxygen permeability, allowing oxygen to pass through the lens and into the cornea. 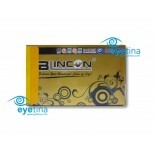 This increase the comfort of wearing soft lenses for extended period or overnight wear. Being generally more comfortable than a hard lens, soft lenses downside is that they do not last as long. Despite of this the comfort presented by soft lenses and the affordability of the lenses makes them the prefer choice by most contact lens user. How long can I wear a contact lens ? It is important to know the wear schedule for the contact lenses as improper use of contact lenses can increased the risk of corneal infections, corneal ulcers and corneal neovascularization. As your cornea requires oxygen to remain healthy; it is important to remove the contact lens following the proper wear schedule. Daily Wear (DW) which are designed to be worn for a single day and removed prior to sleeping. Extended Wear (EW) contact lens are designed for continuous overnight wear and typically can be worn for up to 6 consecutive nights. Continuous Wear (CW) are made from newer materials, such as silicone hydrogels. This type of lens allow you to wear your contact lens for 30 consecutive nights. How often do I need to change my contact lens ? Typically contact lens are categorized by their replacement schedules. A daily disposable lens are worn for a single day and discarded by the end of the day. They are usually made thinner and lighter and are the most comfortable lens to be worn. As they are frequently replace, they gather less deposits of allergen and germs. If your eye are prone to infection or allergic reaction, daily disposable lens are the best choice for you. Beside daily disposable lens, other disposable contact lenses are designed for two-week or even 4 week replacement.